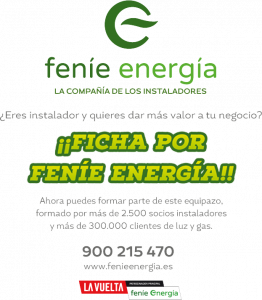 Feníe Energía helps you reduce your energy consumption and make savings on your electricity and gas bills, thanks to advice from the largest network of energy experts in Spain. We stand out by offering customised energy-saving products, solutions energy producers, and a commitment to electric mobility. Thanks to our E3 Energy Efficiency Schools, our agents, installers and FENIE ENERGÍA shareholders receive constant training in the different regulatory changes in the energy market, allowing them to offer customers the most precise and efficient advice. We offer you our electricity tariffs for all types of supply, both low and high voltage. Discover why we are different. Our gas tariffs are suited to all consumers. Come inside and discover them. Want to save on your electricity and gas bill? We offer services for individuals, companies and energy producers, specifically designed for each type of customer, with the aim of ensuring they have all the information they need about production and consumption. Our energy-saving service model is designed for each individual case to improve efficiency at the level of consumption, and all the different factors affecting your bill. We offer electric mobility solutions suited to each consumer, because we are not all the same. At FENIE ENERGÍA we provide all our know-how to make the future a reality.